Sewage treatment, inflow and outflow. Activated sludge basin. Waste water treatment plants. Neutralisation basins. 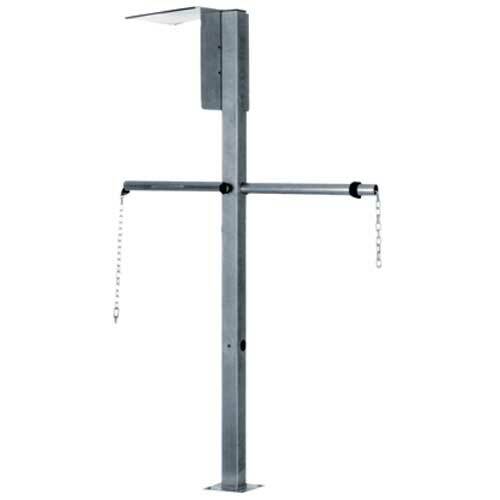 The universal suspension assembly holder CYH101 mounted on an upright post is designed for use in open channels, basins or tanks. Simple and easy installation on basin rims. Flexible adaption to local mounting conditions due to various mounting options and adjustments. Easy rotation of the transverse pipe and altitude adjustment of the suspension chain permit optimal measuring point without interruption of operation. Pendulum motion promotes the sensor self-cleaning effect. The CYH101 is intended to suspend CYA611, CPA111 and the CLA111. The upright post is prepared for mounting of field transmitter. Sewage treatment, inflow and outflow. Simple and easy installation on basin rims. Flexible adaption to local mounting conditions due to various mounting options and adjustments. Easy rotation of the transverse pipe and altitude adjustment of the suspension chain permit optimal measuring point without interruption of operation. Pendulum motion promotes the sensor self-cleaning effect. Voor pH-, redox-, zuurstof-, geleidbaarheidsarmaturen en zuurstof- en troebelheidssensoren. Met zonnekap CYY 101. Protective cap PA6 for pipes 40mm/ 1,57"
Flexdip CYH112 is a sensor and assembly holder for use in open basins, channels, or tanks. It provides outstanding flexibility and enables cost-effective configuration of your measuring points.